I began attending playtest sessions for Steve Jackson Games from the birth of that company around 1980. By the mid ’80s, I was working for SJG as a developer and editor. One day, Steve made an announcement — actually, two announcements. First, SJG had license the title “Isaac Asimov Presents” from a series of short story SF anthologies that Asimov and Martin Greenberg edited. And second, the first game in the series would be designed by whomever created the best game. This was an incredibly gracious offer by the lead designer and head of a major game company. 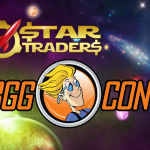 About four to six of us (including Steve) submitted proposals, and after several rounds of development and review, Star Traders was chosen. I don’t remember all of the discussion and development that took place, but I do know that all of us — especially Steve — significantly improved my original design. Meanwhile: as I mention in the video, I like train games — pick-up-and-deliver games — a lot. Two of my favorite games are Rail Baron and Empire Builder, and I still pull out the well-worn boxes to play them from time to time. But they don’t have much interaction, and they don’t have much of a climax. 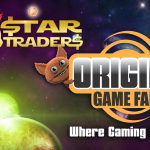 In designing Star Traders, I decided to create a game like those, but different. Common contracts (rather than each player having his own contracts) definitely upped the competition between players, when only the first player to deliver gets paid. So did cards that you can play on each other, slowing your opponents down, getting them lost, costing them Prestige. For a climax, we added the Imperial Mission. First you have to petition the Emperor (which succeeds only on a 5 or 6, but there are ways to boost your die roll), and them you have to successfully complete an Imperial Mission that he gives only to you. Generally, by the time someone wins, nearly all the other players are attempting to complete their own Imperial Mission. Games usually come right down to the wire. A third difference is that rather than traveling along rail lines each turn, you are jumping from world to world. Either you make it or you don’t — there’s no halfway there in space. So the game was released, and it did sorta well. Some people loved it, but not enough. (You haven’t fully experience life until a young woman, upon learning your name, immediately kneels on the floor in awe at meeting the designer of Star Traders. Seriously.) It actually did as well or better in Germany. It went out of print within a few years, and reverted to me a few years after that. From the mid ’90s to a couple of years ago, I made sporadic attempts to get someone to publish it, and made occasional passes at improving it. Some of its features were realistic, but they weren’t fun. For example, when you were ready to jump, you had to declare where you were jumping, and if your roll failed, you went nowhere. Now you roll, and then decide where you’re going, based on what you roll. Similarly, you used to have to deliver your cargo to its original destination, even when someone else had beaten you there. If you didn’t, you suffered a penalty. Now, if someone beats you to a destination, you simply drop the now-useless cargo and continue on your way. Some of the features (especially the Personalities) were not as well balanced as they could have been. I dropped a couple, and changed all the rest to better balance them. Today, people tell me that this Personality is over-powered, or that one is under-powered, and it really depends a great deal on how well someone is playing the Personality’s ability and how each specific game develops. 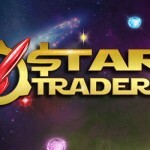 Star Traders today looks a lot like the Star Traders of thirty years ago, but it’s changed — a lot. The board still has 36 worlds, neatly corresponding to the 36 possible rolls of two dice in a row. But most of the names have changed — it used to have seven worlds named after SF authors; now nearly all of them are. I combined the Contracts and Trader’s Luck cards. It used to be that the game had 72 Contract cards and 65 Trader’s Luck cards. Now it has 108 combined Contracts and Trader’s Luck cards. Combining the cards meant that we could effectively add many more cards to the game, but it also meant that you couldn’t depend on certain Contracts or Trader’s Luck cards to appear — they might have been played the other way. Nearly every Trader’s Luck card refers to an SF movie or TV series (but we kept Arcturian Mites on one of them!) Just about every rule in the game, from initial setup to final victory, has been tweaked, if not completely changed. Someday when you have a couple hours of time and I have a large glass of tea, we can go into all the other changes in detail.